Remember back in the 90’s when the most sophisticated electronic equipment in your home was a desktop computer? Today, your home has dozens of highly intelligent electronic devices, many of which rely on your home network to function properly. Considering every member of your family, you probably have some combination of laptops, tablets, smart phones, Smart TVs, media players, gaming consoles, and even a smart hub for your connected home – all connected to your home network. In fact, the average American home has 10 devices connected to the Internet. So what happens when the connection is lost? Here are three common misconceptions about your Internet connection, coupled with solutions that will help you stay online when the power goes out. The world has gone mobile which means that almost all of the devices we use for personal and professional productivity such as laptops, tablets, and smartphones, all run on battery power. However, most of these devices connect to a network using a Wi-Fi connection. Once that Wi-Fi connection is lost, the functionality and productivity of those battery-powered devices is dramatically reduced. Maintaining your network connection and Wi-Fi signal during a power outage is easy with a Back-UPS Connect. APC by Schneider Electric has developed a new series of UPSs to protect home networks. 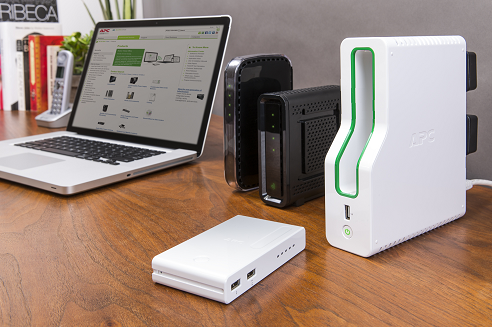 Back-UPS Connect is specifically designed to keep your modem and router running for up to 5 hours during a power outage so you can continue working on your laptop or using social media on your tablet even when the power is out. In today’s connected world, almost every electronic device on your home has the capability to connect to the Internet. Consider how your family uses home electronics. What would happen if you suddenly lost your home network connection at 7pm on a Wednesday evening? Can your kids get their online assignments done? Can you watch that movie sitting in your Netflix Instant Queue? Maybe you have a deadline coming up at work and you need to login to the office? Or maybe you and your son were planning to sit down and play Call of Duty on your xBox while your spouse connects with friends on Facebook. To get the most out of your network connection during a power outage, you need a UPS to support the devices you use the most. APC by Schneider Electric has a series of UPS specifically for home electronics. Back-UPS Pro is available in a variety of sizes depending upon how many devices you need to connect. They all have different VA ratings – which is a measure of how much power you need. The more devices you need to connect, the higher the VA. To learn which UPS is best for you, visit our selector tool. Sure, back in the days of a single desktop computer with a phone line nearby was how most of us connected to the Internet. At the time, a single small UPS to power the desktop was all we needed to stay connected when the power went out. Now, we’re more dependent than ever on our home network connection and the devices we use online are scattered throughout our home. Granted, many of our personal electronics such as tablets and smartphones are mobile and operate on battery, but what about everything else? Your TV, receiver and Blu-ray player, or gaming console needs power. So does your modem and router. These days, you need back-up power protection for a lot more than just your desktop computer. As a best practice, connect your networking equipment (modem, router, VoIP phone) to a Back-UPS Connect. This will protect your Internet connection for up to 5 hours. Next, protect your home electronics with a Back-UPS Pro. Depending on how your family uses the devices in your home, you probably need more than one Back-UPS Pro. Maybe one UPS in the home office for your computer and printer and another UPS in the living room for the TV, receiver, Blu-ray player and gaming console. Staying connected to the Internet during a power outage is important to your family. Visit our website to watch a quick video to see how dependent our digital experience is on our home network. Using a couple of small UPSs allows you to maintain your home Internet connection when the electricity goes out and also provides back-up power for the electronics you use the most. Your digital life doesn’t need to wait for the power to come back on. We’ve had a couple of recent OG&E power outages in our area in Tulsa, OK. We have Cox Cable VOIP, internet and TV. Just called and asked their Tech Support if a UPS would ensure phones work when power is out to the home. She said NO, if power is out in an area no UPS will help. So apparenly COX uses local area power for their cable services. Would appreciate any additional views on this topic. Do I need a separate UPS for my router and PC? Or one ups is enough to? Hi Angieline, thanks for asking the question and I apologize for the delayed response – we were having some technical issues. The answer depends on several factors, including the capacity of the UPS and the amount of power drawn by the equipment you connect to it (in this case your PC and the modem). Keep in mind, you probably want to connect your monitor too so that you can see what you’re doing to shut down your computer in the event of an extended outage. The other determining factor is how much runtime you expect to have in the event of a loss of power. If you only need a few minutes to save your work and shut down, one UPS may be fine for both. On the other hand, if you want to be able to work through the outage, you may want to consider a dedicated UPS for your network. People who connect devices like iPads, laptops, security systems, etc. to the network may also want to ensure the network is available for an extended period so they can stay connected to the outside world during a storm or other power events. You can always check the expected runtime for your equipment by visiting our website and choosing the UPS selector: http://www.apc.com/us/en/tools/ups_selector/ Or you can contact our support team who will walk you through the process.